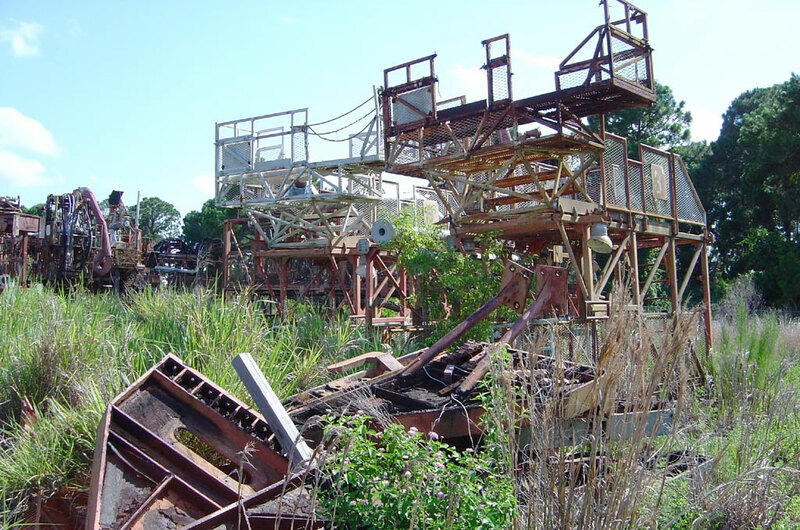 — After once again delaying the work of its contractor to allow time for a private restoration effort to raise funds, NASA has scheduled demolition of the last remaining Apollo Launch Umbilical Tower (LUT) to resume today, reports Todd Halvorson for Florida Today. "We have evidence that indicates that the structure is causing environmental contamination, and we've got a responsibility to deal with that," said Burt Summerfield, chief of the safety, health and environmental division at Kennedy Space Center to Halvorson. The Space Restoration Society had hoped to identify a donor to provide the estimated $40 million to restore the LUT as a national monument. The group will continue its search on the chance funding can be located before the disposal proceeds past the point the LUT can be saved. — After a brief pause to consider restoration proposals, NASA acceded to Environmental Protection Agency requirements last Wedneday and instructed its contractor to resume work disposing of the Apollo Launch Umbilical Tower (LUT). The red metal tower has been classified as "hazardous waste" due to its eroding paint surface. 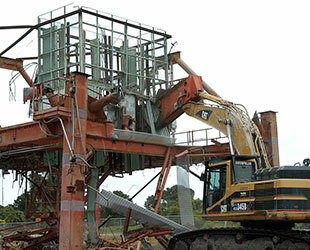 Workers have commenced removal of smaller pieces in preparation for paint stripping that will decontaminate the tower. 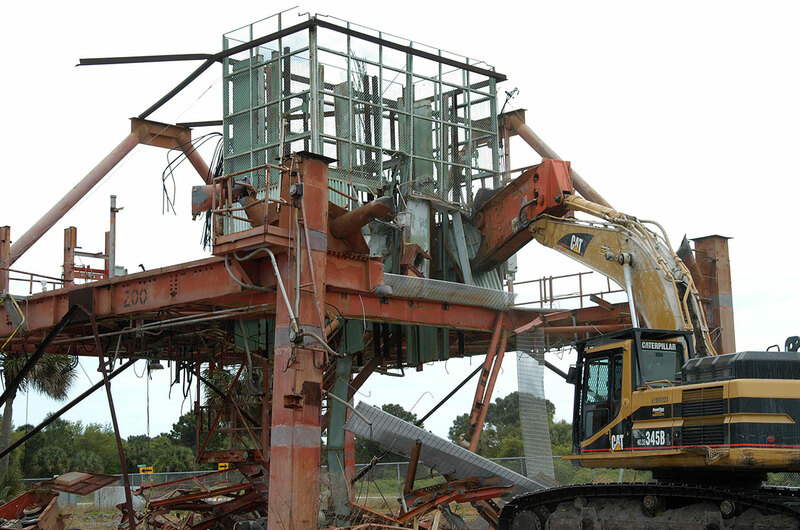 During a six-month process now underway, the LUT will be cut into beams, decontaminated, and hauled off Kennedy Space Center property as scrap metal. Disposal work began on February 12, but cutting of the main pieces will not begin until the end of the month leaving two weeks for the Space Restoration Society to find a donor committed to preserving the tower. One possible sponsor has emerged. "A development company has approached us about a serious proposal for funding the LUT project completely and is considering incorporating it into a larger development" said Ross Tierney of the Society. The SRS hopes to have more information available soon. With over 5000 signatures on their online petition, the SRS remains optimistic that donors can be found in time to save the tower. "We are very grateful to NASA for their helpfulness in giving us a last review of the LUT preservation," said Tierney. "Since government funds were never made available for such purposes, it falls upon us to call upon donors worldwide. We hope to still be able to save the tower." — NASA postponed work Thursday by its contractor, BEM Systems, Inc. of Orlando, Florida, to start disposing of Launch Umbilical Tower-1 (LUT-1), so a review could be made of possible restoration options. NASA's issue with the tower is based on environmental concerns. The red paint on the structure contains high amounts of PCBs (Polychlorinated Biphenyls) and lead. The PCBs are regulated under the Toxic Substance Control Act (TSCA) administered by the Environmental Protection Agency and the lead is regulated under the Resource Conservation Recovery Act (RCRA) which is overseen by the Florida Department of Environmental Protection. The PCB regulations dictate how a structure must be treated and in what time-frame after discovery of the toxic chemicals action must be taken. The RCRA will determine if the tower is a hazardous waste due to the presence of lead or other regulated metals. According to Ross Tierney, Chief Operating Officer of the Space Restoration Society, the group has elicited the support of the National Trust for Historic Preservation, the Bureau of Historic Preservation, and the Florida Trust for Historic Preservation in their effort to save the tower. The Smithsonian Institution, National Park Service, Kennedy Space Center Visitor Complex and US Space and Rocket Center in Huntsville, Alabama have also been contacted. The group's petition continues to grow in signatures, with over 1800 received by Saturday morning. — A team of space history enthusiasts have united over recent months to seek to preserve the Launch Umbilical Tower (LUT) from which Neil Armstrong, Buzz Aldrin and Michael Collins launched to the Moon on America's first lunar landing mission. The Space Restoration Society, which was planning a national campaign to coincide with the 35th anniversary of Apollo 11 in July, was surprised this week to learn from NASA that work to scrap the tower was slated to start on Thursday. "A contractor is currently in place to dispose of [the tower]," explained Ross Tierney, Chief Operating Officer of the SRS in a statement released to the press. "Our team must align with the National Trust for Historic Preservation, the Smithsonian Institution or similar group and we need to find a donor who can compensate the contractor for stopping their work by Thursday or the cutting torches will be lit." "If we do not do this now, the LUT will be demolished and will be lost forever," said Tierney. The Apollo Launch Umbilical Towers (LUTs) were vertical factories used to construct and prepare Saturn V rockets for their flights to the Moon. 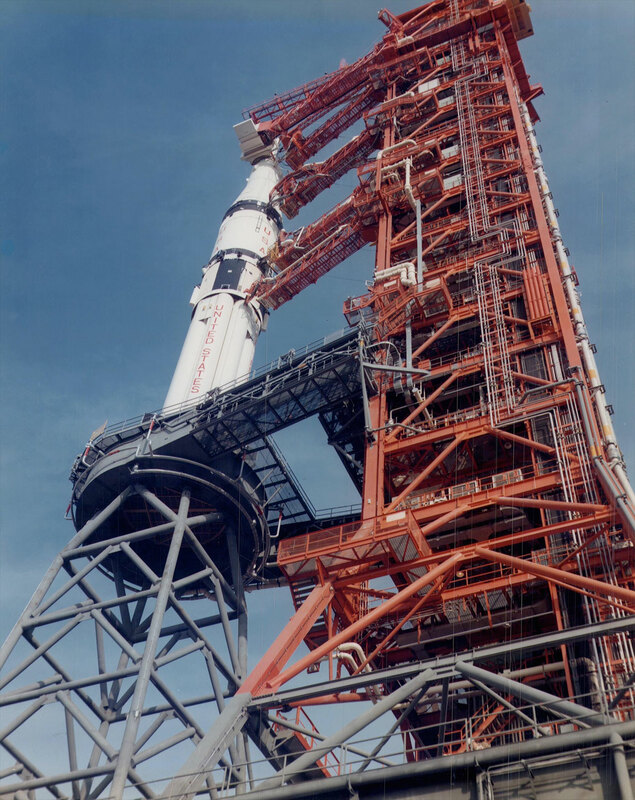 Standing 380 feet tall, the red metal towers supported nine service arms which allowed access to the rocket by engineers and the astronauts, as well as connected fuel and electrical lines. "[LUT-1] is the modern day equivalent of the dock from which the Santa Maria sailed for the New World." said the group's spokesman Jim McDade. "Future generations will be very disappointed if we allow such an important piece of history to be lost." In addition to launching Apollo 11, LUT-1 was also used to support the first Saturn V launch (Apollo 4), the first manned lunar orbit mission (Apollo 8), all three crewed Skylab space station launches, and the first international spaceflight (the Apollo-Soyuz Test Project). In 1983, NASA announced plans to dismantle LUT-1, so its base could be modified into a mobile launch platform for the Space Shuttle Program. Pressure from Congress canceled those plans and instead the tower was carefully disassembled in a manner that would allow for it to be rebuilt later. 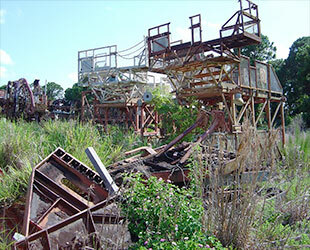 Taken down one level at a time, LUT-1 was moved to an open-air storage area behind the Kennedy Space Center administration offices, where it has resided until present. Since then, the tower has been left to slowly gather rust. Its red paint, which contains toxic materials, has been seeping into the ground each time it rained and has now raised environmental concerns by the local authorities, hence NASA's current plans for disposal. LUT-1 leads the National Parks Service's list of "26 Man in Space" sites which are "nationally significant". In prior years, the National Trust for Historical Preservation has listed the tower as one of America's "most endangered historic places", a distinction the SRS is trying to restore. According to Tierney, NASA Adminstrator Sean O'Keefe has been among those involved in discussions with the group this week. The Society has proposed an Apollo National Monument based around the restored tower and located at Kennedy Space Center for inspirational and educational purposes. It is estimated the project will cost between $40 and $80 million to complete.